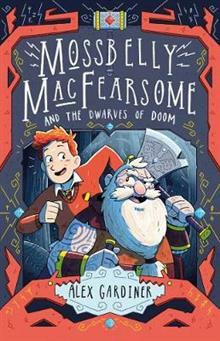 Roger is just an ordinary boy, in an ordinary world - or so he thinks, until a grumpy dwarf warrior, Mossbelly MacFearsome, appears out of thin air and saves him from the school bully. If that isn't incredible enough, now Moss has decided that Roger is the perfect human companion for his daring quest to defeat the dwarves' arch-enemy Leatherhead Barnstorm and his horrifying horde of monstrous (but very polite) gorefiends. If Roger doesn't help Moss, the world as we know it will be destroyed by ogres and dragons and the race of humans will be annihilated. If he does help, he will be late for his tea and his mum will be going mad with worry. A Highland castle, a trainee witch who knows karate, and an ancient spell to be broken - by King Golmar's braces, just what has Roger got himself into? A hilarious action-packed fish-out-of-water adventure, perfect for young fans of Terry Pratchett, Neil Gaiman and Cressida Cowell. Alex Gardiner spent several years in the Merchant Navy before embarking on a sales and marketing career in the UK motor industry - with 20 years as regional manager for Jaguar Cars. Now retired, he lives in East Dunbartonshire with his wife. He reads a lot, writes fantasy for children - and plays very bad golf.